My main recollection of waking up on Day 3 was the feeling of getting out of bed in full view of the passing public. It wasn’t that we’d slept in or that we’d mistakenly camped in the town square; it was only the odd couple of dog walkers and joggers but it still felt strange to be stretching and crawling out from my shelter at 6:00 AM in front of people busily going about their morning routine. So as we had on Day 2, we promptly packed up our stuff, back into our bags and for the final time headed off to find supplies. I don’t want anyone to start thinking that I’m affiliated to Sainsbury’s or anything; it’s just that there happens to be one in both Whitby and Guisborough! So off we rode back down the Guisborough Forest hillside into town to Sainsbury’s for supplies and toilets. Malcolm’s preference was not to ride down to Guisborough, knowing full well we’d have to ride back up again, instead he was much more of the view that we should hold on to the altitude we already had and stop on-route somewhere else instead. Unfortunately I had to explain that there wasn’t a ‘somewhere else’ on our route at all for this day and so we quickly surrendered our altitude on the fireroads of Guisborough Forest as we had for tea the night before. We actually managed to mistime our arrival at Sainsbury’s by 30 minutes and found it to be well any truly, not yet open. So we headed off for breakfast first and after a big detour out to the cafe at Pinchinthorpe which was also, not yet open, we ended up at Gregg’s. Now, Gregg’s was cheaper than the roadside van of the previous day but the sausage and bacon bap that we scoffed didn’t live up to the standard set by the egg and bacon from Whitby. And that was a point of consensus not just my own opinion. Of course it was all much needed energy and a fairly decent accompaniment to the obligatory morning coffee all the same. And so we headed off up the hill to the top of Guisborough Forest again; the view over Guisborough is outstanding and although Malcolm would have preferred not to on this occasion, I quite like riding up hills like this. As with all the photos on my blogs; go ahead and click the image to see a larger version and get the full effect. There are lots of trails well suited to mountain biking around this area and I’ve explored a fair few on previous visits, so we took the fast downhill to Sleddale Farm and then after climbing out from Sleddale, the slower more technical downhill around the edge of Lonsdale Plantation to Lonsdale Farm. 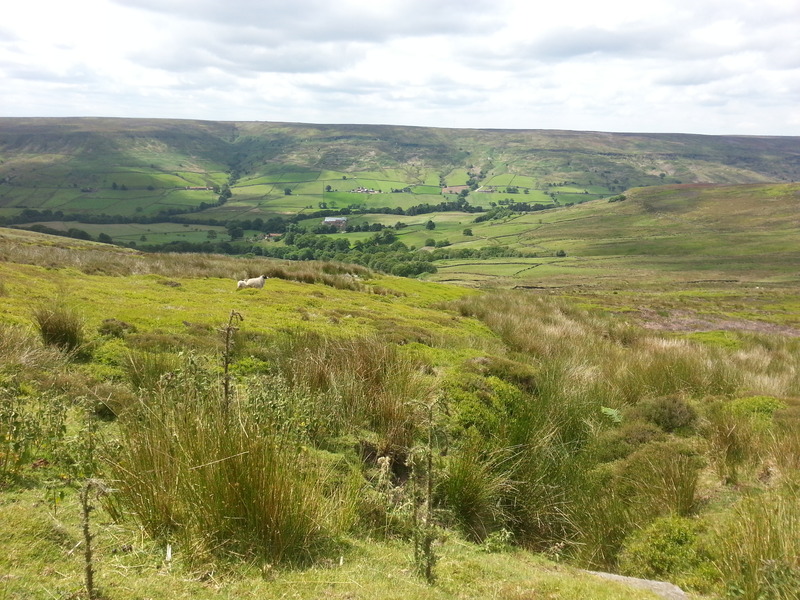 We made the decision to get back to the car sooner rather than later and so carried on the ride out towards Rosedale Abbey at this point, rather than looping around some of the other fun trails. I had the next day off work to recover whereas Malcolm didn’t have that luxury and wanted some evening recovery time. 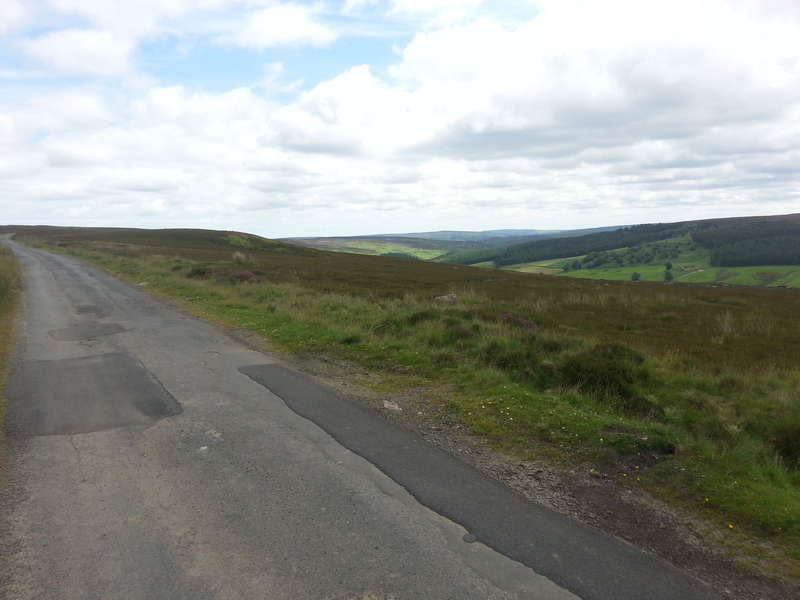 So after a short sharp climb up and over to Kildale we started out on the road climb up to Kildale Moor, through the remoteness that is this area of the North York Moors and on to Bloworth Crossing. Again there are loads of other trails around this area that I would love to ride and explore but that will have to wait for another time. Bloworth Crossing is the point where our bridleway meets a track that used to be a railway once upon a time and as you ride it you can really see that it was originally built for trains. The banking is significant in places and it clearly hugs the contours of the land where ever possible. This meant that we could really get a move on and so we made excellent and easy progress along this well surfaced and pretty much flat trail up until the point where I called a lunch break; well I was getting hungry and overlooking the valley from our raised position certainly made for a scenic eating spot. Once we’d reached the end of the ex-rail trail, we took the path of least resistance (that’ll be road then) off the south side of the moors and down into Hutton-le-Hole. 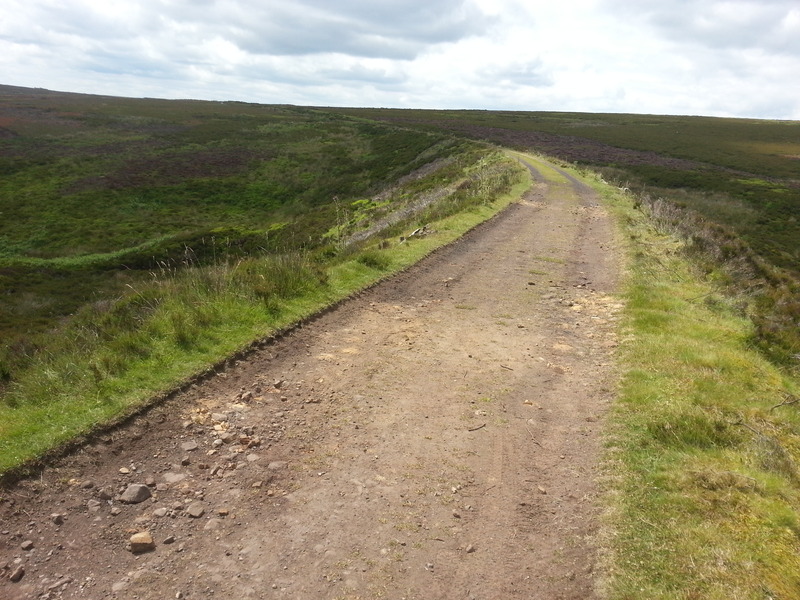 We agreed that this is definitely a road to ride on our road bikes, long fast downhill that seems to go on for miles. Malcolm left me for dead on this downhill section, no matter how fast I forced my legs to spin I couldn’t keep up with him and his larger chainring; finally I found part of the ride that my new 32T narrow/wide single ring didn’t cope with quite so well. 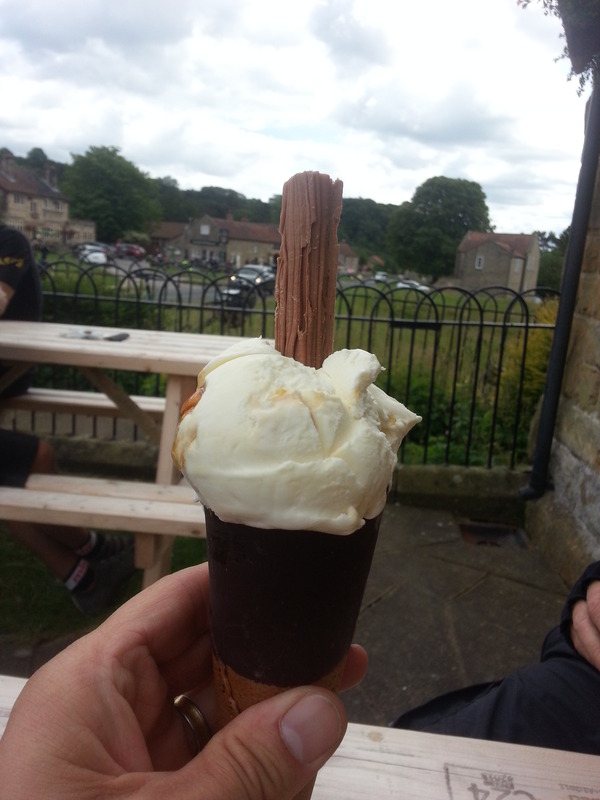 Once we’d reached the bottom of the hill and before turning off to ride through Lastingham and on to Cropton we stopped at the first cafe on the right for a much deserved ice cream. Here sat outside on one of the benches we got chatting to a couple of guys doing the coast to coast off-road and they had chosen to pack all their camping gear into a trailer. It was good to share stories and experiences but at the end of it all I confirmed in my mind that the luggage choices we had made were much better than their trailer option. At this point we relaxed a bit and pretty much felt like our 3 day trip was over; it wasn’t quite. The ride through Lastingham and into Cropton still held a couple of short but fierce climbs for us to conquer before we got back to the car, but get back to the car we did and packed away our kit, still buzzing from what had been an awesome few days. Well worth the planning time, well worth the 3 days of annual leave from work (5 for me) and well worth doing again sometime in the future; it’ll be a different route and a different area of the country no doubt but it will happen for sure.